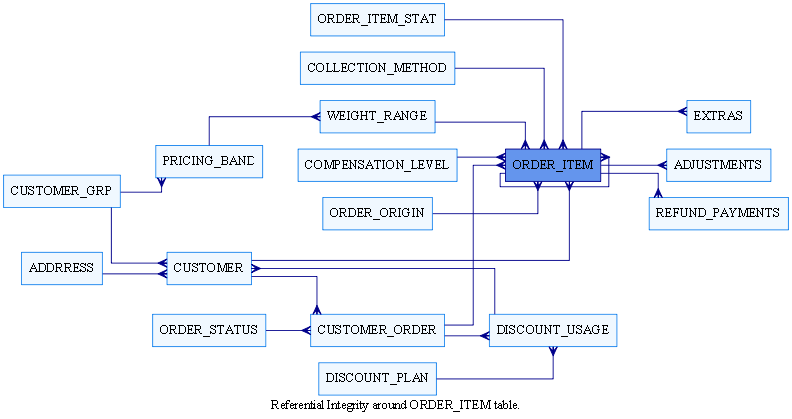 Generate Entity Relationship Diagrams from a SQL Script. Sometimes, just occasionally, you find yourself as a DBA on a site where, for some strange and unknown reason, you don’t have an Entity Relationship Diagram (ERD) for the database that you are working on. You could use a tool such as Toad, or SQL*Plus (or even, SQL Developer – if you must) to generate a list of referential integrity constraints. There has to be a better way. The problem with lists is, they are just words. And they do say that a picture is worth a thousands words, so lets do pictures. Graphviz is a set of tools for visualising graphs (that’s directed or undirected graphs as opposed to Cartesian graphs by the way) and the source files for the utility are simple text files. So, can we generate an ERD in text format and have graphviz convert it to an image? Of course we can. But first, get thee hence to https://graphviz.gitlab.io/download/ and download the utility for your particular system – it runs cross platform and is free. The following query will generate a list of parent -> child lines in the output, that show the relationship between any pair of tables, given a suitable starting owner and table_name. -- around a single table. accept owner_name prompt "Enter owner: "
accept table_name prompt "Enter table name: "
// ORDER_ITEM is the starting table. // The remaining nodes are this style. // These are the parent -> child edges. A file by the name of refint.svg will be created. And it looks like the following, for this particular example. The diagram is only as good as the referential integrity in your target database. This much should be obvious – if there are no referential integrity constraints, then all you will get is a single entity. If that’s the case, I’d be looking for another job as I suspect that all the required checking is being done in the application, rather than in the database – best avoided! And finally, you will not generate a full schema ERD with this code, but it’s handy for stuff around and about a particular table. I'm getting on in years now, having been in IT for around 30 plus years. I've been in support for most of them too as well as being a developer. I run, with my wife, our own software company. I do Oracle and development as required, and Alison does software testing. She's good! I like reptiles, I used to keep bees but my wife suddenly became highly allergic to bee stings, so I don't keep them any more. I am most definitely a dog person and don't like cats much at all! My wife says I'm grumpy! She may be right.